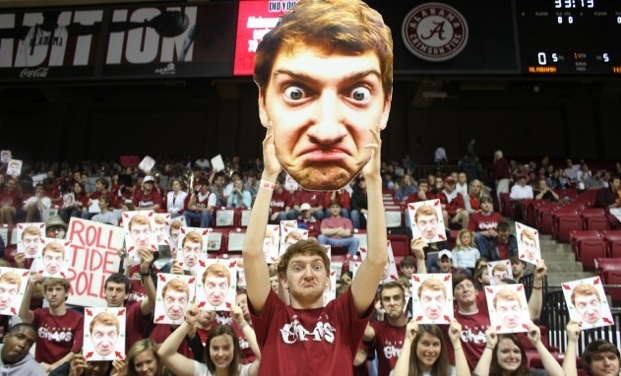 The Alabama student section is clearly excited about what the Tide and Arkansas can teach us about defensive rebounding. This week while researching a piece on Arizona for Insider, I happened to notice that a) the Wildcats aren’t very good at defensive rebounding, and b) it hasn’t seemed to matter very much. Sean Miller’s team has far and away the best defense in the Pac-12, and possibly even the best D in the country. Does defensive rebounding matter? Arizona holding Pac-12 to 0.86 points per trip, No. 10 in league play in DR%. See also Cuse 2012. Sweet! Now I know how Sir Arthur Eddington felt when he photographed the solar eclipse of May 29, 1919 from the island of Principe in order to test Einstein’s theory of relativity. Or not. But two real-world teams holding other things constant for us does come in handy. So the Tide and the Razorbacks are identical on two of Dean Oliver’s Four Factors. What about the other two? Lastly I propose we eliminate the impact of opponent turnover rate on this question entirely by just looking at possessions where the opponent doesn’t give the ball away, what I call an effective possession. What do these two SEC rivals look like in terms of opponent points per effective possession? To sum up, Alabama has a slightly better defense per effective possession (and also a slightly better in-conference defense period) even though the Tide’s opponents have been shooting lights-out from the line and everything else is identical. The difference is entirely the product of defensive rebounding, where Alabama’s pulling down 68 percent of its SEC opponents’ misses, while Arkansas is getting to just (a pathetic! almost Vanderbilt-like!) 58 percent. Defensive rebounding does matter, at the margins. While it happens to be the case that Arizona opponents are finding it’s no easy task to score even when they get an offensive rebound , the Wildcat D would indeed be even better if Miller’s men pulled down a few more defensive boards. That being said, defensive rebounding alone is very clearly not enough. If you’re going to specialize on defense, force misses at all costs. A colloquium on colloquialisms. Last night during the Wisconsin-Minnesota game, a Twitter war broke out, fierce and hot, on perhaps the most pressing issue facing our nation today. How do we refer to people from places where it’s very cold? To be clear, “Minny” + “Wisky” unacceptable even on Twitter. RT @YahooForde Minny lost best player in opening minute, still up 12 on Wisky. @jallotta @YahooForde People from those places yell at you when you say it. Midwest equivalent of “Frisco.” Tags you as an interloper. But, hey, Pat and I are just a couple of interlopers on this question, so I’ll toss this back to any experts reading along here…. I’m from Illinois, and I lived in the Twin Cities for a couple years a while back. In my experience these terms acted like fingernails on a chalkboard with the locals, but maybe my experience was unrepresentative or perhaps times have changed. Upper Midwesterners are herewith invited to descend upon me on Twitter and decide this burning question once and for all. This entry was posted in counting things, hoops, philological click-bait on January 23, 2014 by johngasaway.